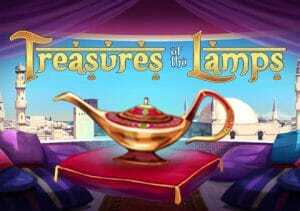 A trio of female genies can deliver plenty of magical action in Treasures of the Lamp, an Arabian-themed video slot from Playtech. It’s played using a 5 reel, 20 payline game engine and comes with plenty of extras. They include respins with locked wilds, spreading wilds and added wilds. There’s also a picks round and a free spins feature where up to 30 free spins are on offer complete with multipliers of up to 5x. Play on your desktop, tablet or mobile device from between 20p and £500 per spin. The design in Treasures of the Lamps is very good. The action takes place against a backdrop filled with white buildings, rooftops and minarets and there’s a bouncing Arabian-style soundtrack playing as you spin. On the reels you’ll see lower value royal values plus chests full of jewels, swords, palaces and white stallions. The most lucrative standard symbols are the trio of genies – Gloria, Audrey and Ruby. These spin in 2 high stacks. Ruby is the best of the 3, paying 50 times your bet for a 5-of-a-kind combo. There’s also a wild that awards up to 250 times your bet per payline! Playtech has packed in plenty of extras into this Arabian adventure. The Magic Lamp feature – this triggers at random. 1 of the 3 genies can grant you a wish. Gloria delivers spreading wilds, Ruby offers respins with locked wilds and Audrey adds up to 5 extra wilds. A new payout calculation is made with the wild extras in place. Free Games feature – land the Plays scatter on reel 1, the Multiplier scatter on reel 5 and the Free Games scatter on reel 5 to trigger this bonus round. The number of free spins and multipliers awarded depends on the figures shown on the scatters. You could get up to 30 free spins with a multiplier of up to 5x. The Magic Lamp feature can summon up the wild extras during every free spin too. Stargazer Bonus feature – the plays and multiplier scatters on reels 1 and 3 plus the Stargazer scatter on reel 5 trigger this pick me round. You’ll be taken to a new screen and offered a selection of stars. Pick to reveal cash prize. If your combination forms a constellation, an extra prize is awarded. You could summon up 1 of the genies here too. Extra cash prizes and more picks are awarded by Ruby. Audrey offers multiple prizes from a single pick while Gloria boosts the size of the prize awarded from a picked star. The number of picks and multiplier is decided by the figures on the scatters on the triggering spin. You could get up to 30 picks with cash prizes being subject to a 5x multiplier. There’s plenty to like about Treasures of the Lamps. For starters, it looks and sound terrific. The range of extras on offer impresses too which makes it a good choice if you like plenty of variety from your bonuses. Get on a roll with the multipliers in the Free Games feature and these magic lamps could indeed conjure plenty of treasure. I also recommend you try Desert Treasure II and Sultan’s Gold (from Playtech) which have a similar feel and are equally volatile.